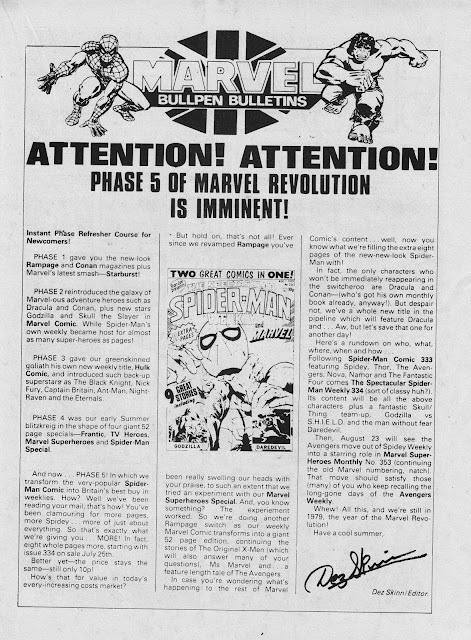 Once again, here are the UK BULLPEN BULLETINS pages that appeared in MARVEL COMIC during it's final month on the stands. 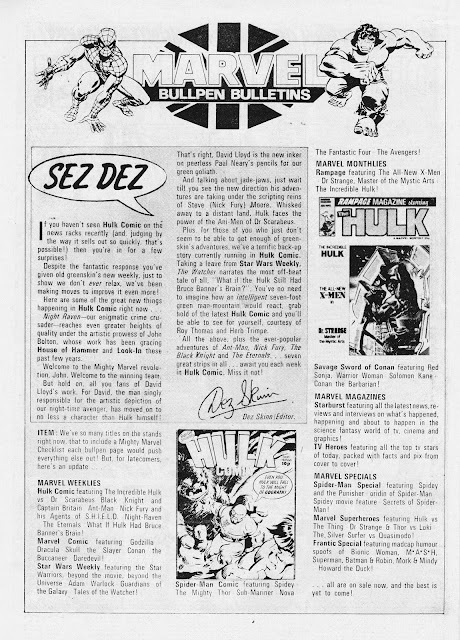 The first is the usual puff-piece but the second is a little more fun as Dez valiantly attempts to spin the demise of MARVEL COMIC as the fifth part of his glorious revolution. In fairness, the launch of MARVEL SUPERHEROES was one of his more lasting contributions to the M-UK canon, chocking-up a reasonable run (see posts past) and - after his time - housing the revived Captain Britain. Talking of Chiller pocket book, I remember that when all 4 pocket books were launched ( 1979 ? ) they invited readers to write in to a letters page and gave an address to write to but no letters pages ever appeared. I've been reading your old post on the pocket books and all the memories came flooding back ( I'd completely forgotten about Star Heroes) but I'm still certain about the non-appearance of any letters pages which I found disappointing at the time. The pocket books and Conan monthly were the only Marvel UK output that still interested me by about 1981- for me it was mostly U.S. Marvel by then. Yup, I think you are right. 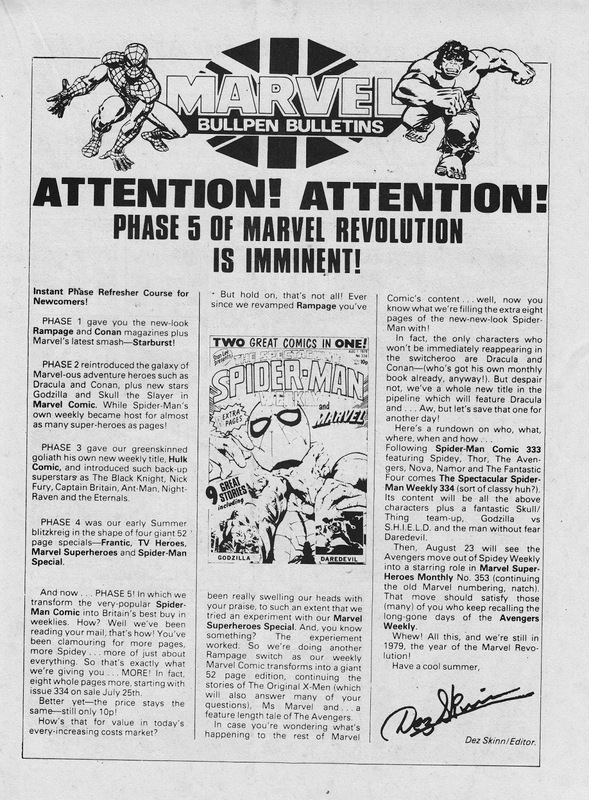 SOME of the first issues did promise a future letters page (I think FANTASTIC FOUR and - maybe SPIDER-MAN did but STAR HEROES didn't) which never materialised. The overall impression I have of the Pocket Books is that they were designed to make the minimum demands on the production team at Jadwin House. I guess editing, typing and laying-out a letters page was a job too far. Or that initial request for letters didn't generate enough useful correspondence to make a page viable. I'm no expect on the pocket libraries from marvel's rivals but - from what I've seen - they didn't include letters columns either and - maybe - Marvel were so keen to follow the formula (if not the format) that they didn't bother either. Des Skinns Marvel Revolution came with its high and lows. The monthlies were brilliant, the weeklies less so, but only because of the shortness of so many strips. I can't knock him for the general idea, but it lost something in practice. The British produced strips were amazing, so too was the specials and pocket books. A noble experiment!